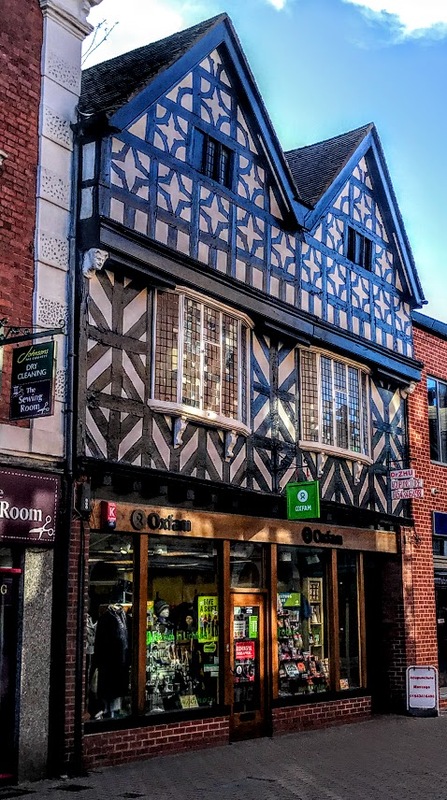 I was writing earlier this week about the Three Crowns on Breadmarket Street, Lichfield, a ‘lost local’ pub and the inn where Samuel Johnson stayed frequently during his return visits home to Lichfield. At one time, however, there were so many pubs in this part of the heart of Lichfield, that magistrates considered reducing their numbers in the 1930s and cancelling their licences. One of these, around the corner from the former Three Crowns is the former Castle Inn at Nos 16 and 16A Market Street. This is a Grade II listed building, and is a Tudor-era, timber-frame building that dates from the late 16th century. This is a three-storey building with a two-window range, jettied upper floors and two gables. Building has moulded bressumers – the one on the first floor is on joist ends, while the one on the second floor is on end corbel heads. The first floor has 1:3:1-light canted oriels on shaped brackets with leaded glazing and iron opening casements. The second floor has three-light windows with wooden-ovolo-mullioned windows that have leaded glazing. The square framing has herring-bone bracing on the first floor, and decorative bracing on the second floor. The rear of the building is almost as interesting, but with plainer framing, a gabled wing and a smaller gabled wing to the left. The Castle Inn was managed by David Cox in 1793, and later it was run by his son David Cox from 1818 to 1850. The last landlord was William Norman Gallimore, and the Castle Inn closed as a pub in 1962. 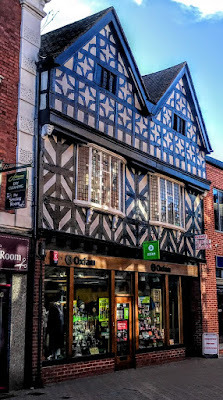 Today, the former Castle Inn is divided into offices and a shop for Oxfam, with a late 20th century timber shopfront on a brick plinth with an entry to the right. A few doors away, the Scales has survived as a pub at No 24 Market Street. This too is a Grade II listed building on the south side of Market Street, and dates from the early to mid-18th century. 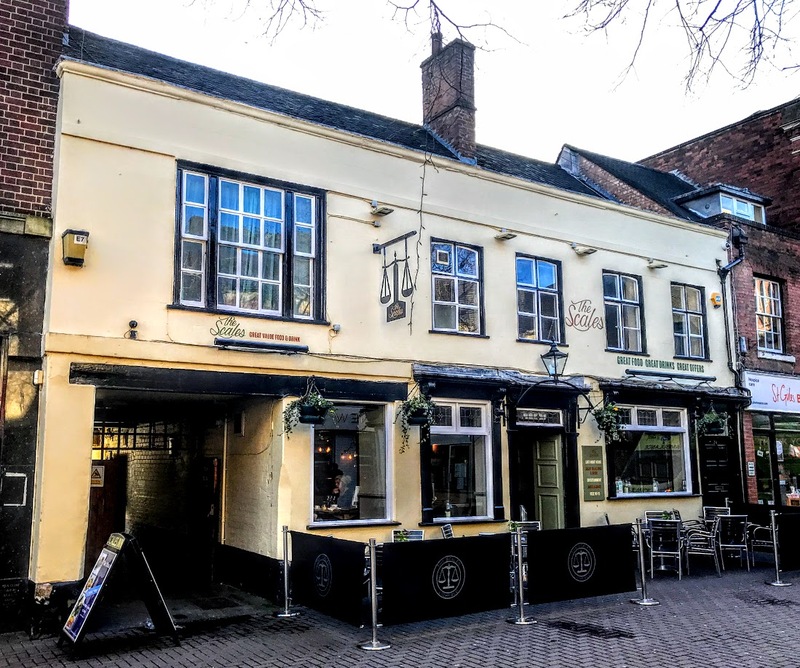 The pub derives its name from a time when it was the venue for the jockeys’ weighing room at a time when races were held at venues throughout the Lichfield area in the 18th and 19th century. This two-storey, five-window range building has interesting stucco work on the façade, a tile roof with brick stacks, platt bands over both floors and at the top there is a coped parapet. The entrance to the right of the centre has a doorcase with pilasters and a bracketed cornice, and there is a stained-glass overlight above the panelled door. The carriage entrance to the left end is an interesting feature that has survived since this was one of Lichfield’s old coaching inns. Two windows on the ground floor have consoled cornices, one to the right end has a bracketed cornice, indicating that this may have been the original entrance, and one window has a plain opening; all these windows have etched plate glass. On the first floor, the window at the left end is 4:12:4-pane tripartite sash window; the other windows have cross-casements with iron opening casements. There are gabled wings at the rear of the building. The Scales at 24 Market Street is another of Lichfield’s ancient inns. There was a tavern or inn on this site in the 17th century, and it was well established by 1784 when the Freemasons established their earliest known lodge in Lichfield here. Lodge 224 (originally designated 220) on the register of the Antients Grand Lodge was formed at the Scales Inn on 10 March 1784 and was officially constituted on 1 April 1784. This was the seventh lodge to be constituted in the County of Staffordshire, since the formation of Grand Lodge in 1717. This lodge ‘swapped sides’ and became a ‘Moderns Lodge’ that was constituted as Lodge of Unity on 24 July 1787 at the Three Crowns Inn around the corner in Breadmarket Street Lichfield. The last record of this lodge ws of a celebration meeting with a parade to Lichfield Cathedral on 16 September 1797. The lodge had closed by 1811. Meanwhile, in 1793, it was run by John Hill, and was run by members of the Hill family 1834, and in the early part of the 19th century it was known as the Swan and Scales. The races continued in Lichfield until the racecourse was moved permanently to Whittington Heath with the opening of Whittington Barracks in 1895. Neil Coley notes that from 1879 to 1905, the landlord of the Scales was Charles Smallwood, who also ran a tobacconists’ business, livery stables and a carriage and car hire company, which he ran from the stables in the pub yard. He died in June 1905 when he struck a match to light his cigar, startling his horse, who bolted – Smallwood’s trap overturned, he fractured his skull and died. His son, Charles H Smallwood, took over the business, but ended his own life tragically at Torquay in 1923. Two years later, the pub was run by RC Cornwell, who offered bed and breakfast at 5 shillings a night. The Scales almost closed in the 1930s, when magistrates suggested there were too many licensed premises in Market Street. But the threatened closer was averted when Woolworth opened across the street, brining more business into Market Street. In the early 1970s, the pub still displayed a jockey in blue and yellow silks sitting on the weighing scales. John Shaw, The Old Pubs of Lichfield (Lichfield: George Lane Publishing, 2001/2007). Neil Coley, Lichfield Pubs (Stroud: Amberley, 2016).